October 21, 2015. Today is the day Marty traveled to in the beginning of Back to the Future II. This is important enough that I wanted to interrupt my already in progress AWESOME-tober-fest to throw out a bunch of Back to the Future articles I’ve written over the years. Being as big of a fan of that movie as I am, I’ve written a ton of articles remembering that movie. And it’s sequels. How about some Podcast listening for you today. So read some of these articles, listen to some of those podcasts and thoroughly enjoy Back to the Future Day! The Nerd Lunch Podcast’s big brother podcast, The Atomic Geeks, are celebrating 5 years of podcasting awesomeness. After 5 years of Geek News (well, almost 5 years of that), Atomic Picks, Meat and Potatoes, Crying Out Loud and reviewing movies at gunpoint they have finally clawed their way to their 250th episode. And with only a few casualties along the way (Andrew “Twilight lovin'” Bloom and their dignities). CT has spent the better part of the last 6 months combing through the Geeks’ archive and creating the greatest clip show in broadcasting history. And then he recruited Mark Dury to interview each of the Geeks and talk about the last 5 years and present all of these awesome clips. Expect to hear Downs’ talking about Boxwood Brewing, Christian talking about his terrible food analogies and metaphors and Bloom’s unconditional love of Twilight. It’s a massively entertaining show and if you are even the slightest fan of the Atomic Geeks you owe it to yourself to listen to this 2+ hour retrospective extravaganza. It’s got EVERYTHING. So click one of the images above to go check out the Atomic Geeks’ 250th episode celebration. Congrats guys on the 5 years. We hope you get at least 5 more out of it. 50 years ago today, JFK was killed in Dallas. It’s up to you to interpret how or why he was killed. There are plenty of theories to choose from. Personally, I think here is more to the “Lee Harvey Oswald story” that we don’t know. I don’t think Oswald planned it on his own, though he may have actually done the deed on his own. I don’t know, a the time this occurred, I wasn’t going to be born for another 11 years. Anyway, I’m sort of fascinated by Kennedy’s assassination and the culture storm that has sort of erupted around it. I even visited the site of the assassination. I graduated college in Summer 1997 and was sent to Dallas, TX for 7 weeks of training for my new job in IT consulting. While there, I decided to take advantage and visit Dealy Plaza and the Texas School Book Depository building. A few friends of mine and I drove there and when we arrived we decided to drive the main street in front of Dealy where Kennedy was killed. 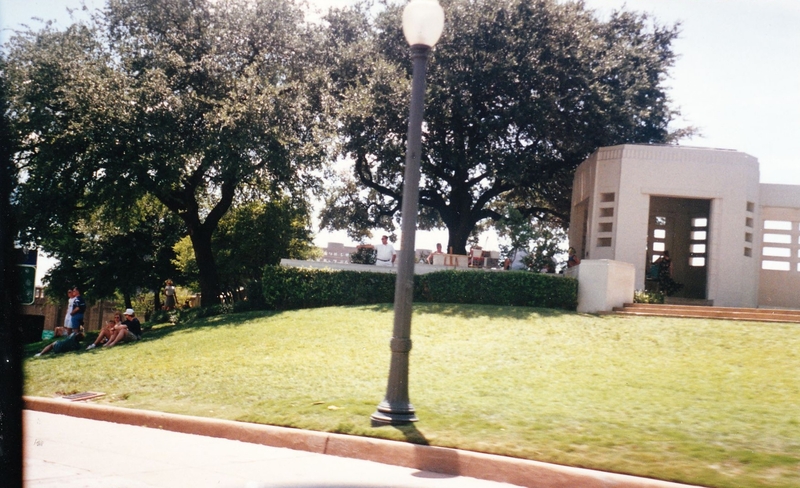 Below is a picture out of the car window at the infamous fence on the grassy knoll (on the left) next to Dealy Plaza (white structure on the right). Our car is approximately where Kennedy’s limousine was when the shots were fired. Maybe even a little bit past. 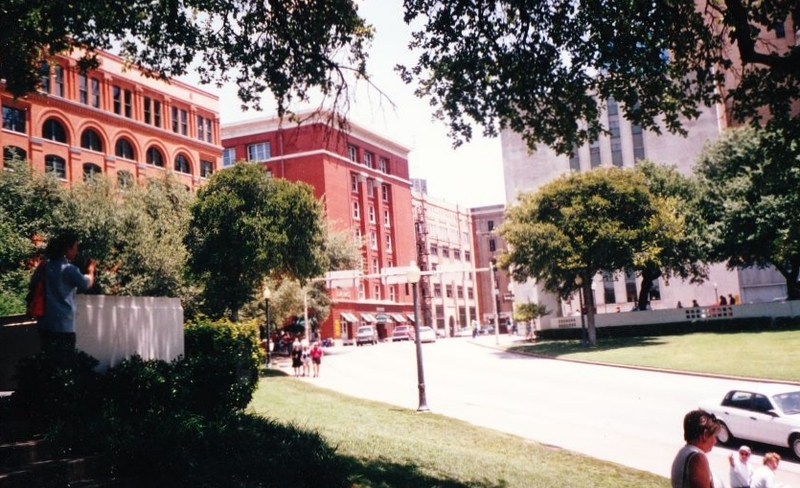 After getting out of the car and walking towards Dealy Plaza, I stood where Abraham Zapruder stood and snapped a picture of the road Kennedy traveled and the Texas School Book Depository building looming in the back (brick building far left). In Zapruder’s footage there was a street sign on the road that blocked the view back in the early 60s. The street lamp in the very middle of the picture is the same one that is in the above picture. I’m not going to lie, standing in Dealy Plaza and on the grassy knoll looking back at the School Book Depository building was surreal and a bit eerie. Lots of living history. So much happened. It just feels ominous standing there. My group of friends and I probably didn’t talk for like 10 minutes as we walked around. After looking around a little bit we walked towards the School Book Depository building to get a better look. The Depository is no longer operating. It was bought by the state and is now run as The Sixth Floor Museum. Tours are offered. So we bought a ticket. 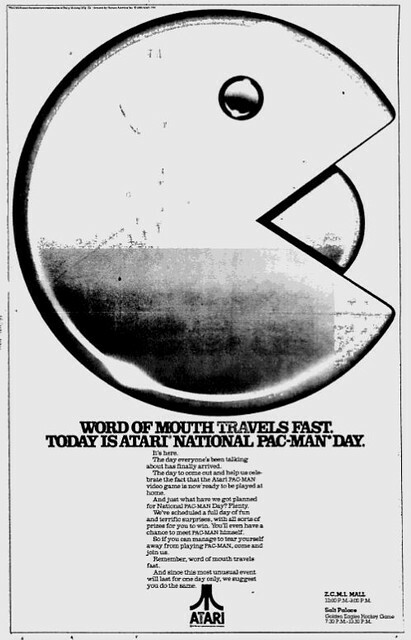 It’s Atari National Pac-Man Day! Today marks the 31st annual Atari National Pac-Man Day. 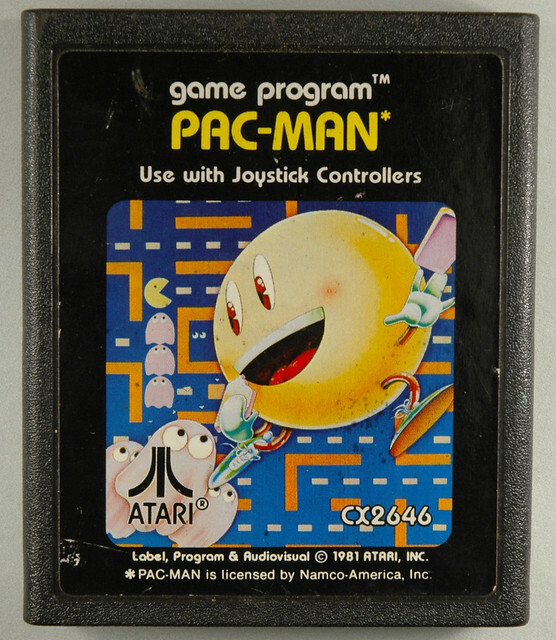 Atari declared National Pac-Man Day on the day they released the Atari port of Pac-Man back on April 3, 1982. Pac-Man was a cultural phenomenon in the early 80s. It was merchandised as thoroughly as anything is today. So on this most auspicious holiday think back on the Atari 2600 and the game of Pac-Man. Maybe head on over to an emulator site and play a game. Enjoy one of the first video games to become a global phenomenon. 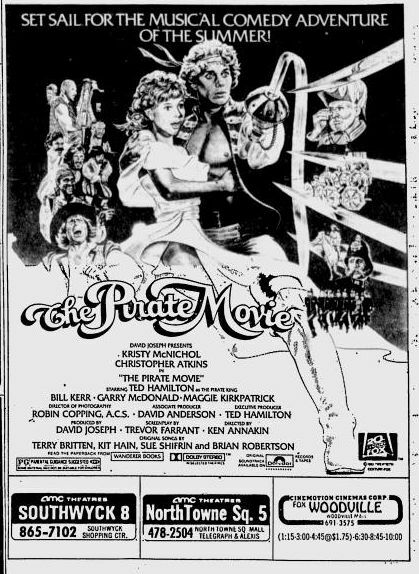 The Pirate Movie starring Christopher Atkins and Kristy MacNichol was released on August 6, 1982, which is 30 years ago today. Many people consider this movie a cheesy knockoff of the play Pirates of Penzance. However, while it’s incredibly cheesy, it’s more accurate to say that it’s a spoof of the Penzance play. It did not set the box office on fire, but HBO would play it continuously throughout the 80s causing it to have a cult following. Here’s a newspaper ad of the movie from the day it was released on Aug 6. 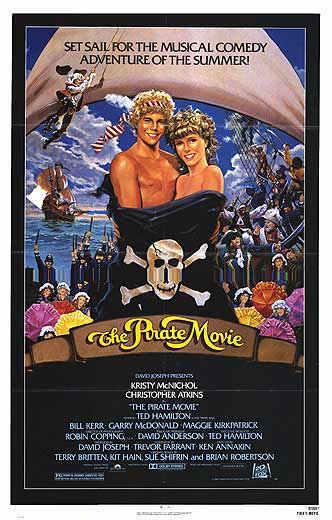 Not only did this movie spoof pirate movies, it also spoofed musicals like Grease and even had some Star Wars jokes. It seemed like the cast had a really good time making it and most of the songs were very well written. I am a big fan of musicals and this was a great one. The soundtrack is truly one for the ages. I still listen to (and workout out to) songs on this album. 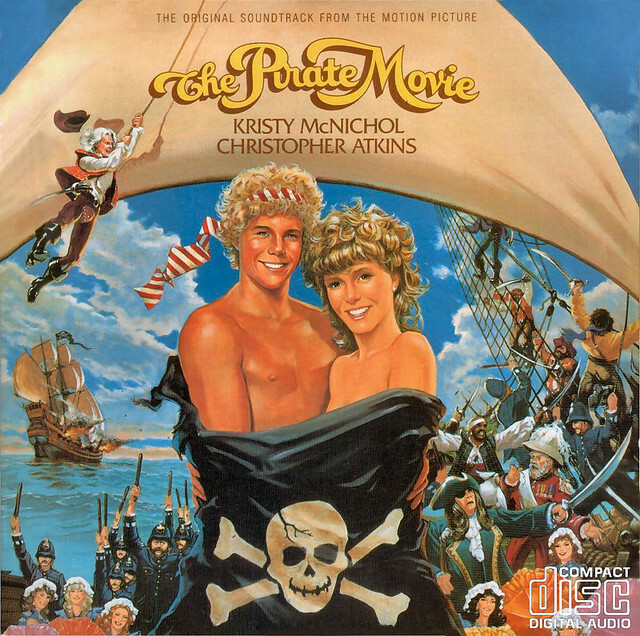 The songs on the album included some of the more famous Penzance songs like Modern Major-General and Pirate King, but also featured newly written songs specifically for the movie. This summer is the 20th anniversary of the 1992 Olympic Men’s basketball team. The original NBA “Dream Team”. To commemorate this anniversary, 7-up products have a set of 7 collector cans featuring 5 of the legendary team’s members. Here is the lineup of cans available. 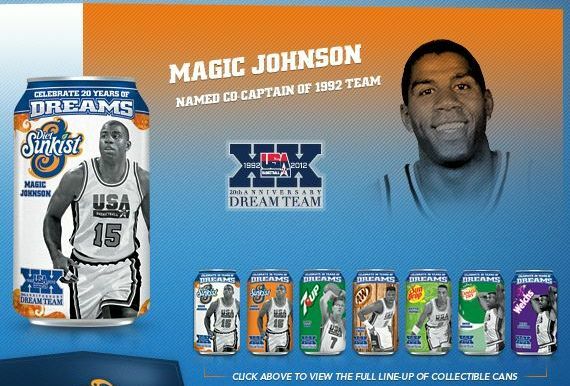 The five players chosen to represent the “Dream Team” for this set are Magic Johnson (Sunkist), Larry Bird (7-Up), Patrick Ewing (A&W), Scottie Pippen (Sun Drop) and David Robinson (Canada Dry Ginger Ale). As I said, there are only 5 of the 12 players represented, but there are 7 different cans. Consequently, Magic Johnson is also on Diet Sunkist and David Robinson is also on Welch’s Grape. I’m surprised they didn’t go for the full player roster and have 12 collectible player cans. When I found out about this I was actually concerned that I would have to hunt down 12 more collector cans so soon after my last hunt for cans (see Avengers cans) just ended. I need not worry now. I’d like to get all of these cans but I think I’m only getting the Bird and Magic cans. And I’ll probably get only the Diet Sunkist Magic can. Honestly, I’m not surprised about Michael Jordan and Charles Barkley being absent from this set. They have separate likeness deals that have always made including them in NBA deals dicey. Jordan rarely showed up as a playable character in NBA Live games in the 90s. However, why not include cans of Stockton and Malone, Chris Mullin, Clyde “The Glide” Drexler or Christian Laettner (not really missed, btw)? I’m very saddened by the absence of Stockton and Malone especially. I was a big fan of the Jazz in the late 80s – early 90s. I’ve even seen them play at The Delta Center in Salt Lake City. Next to Larry Bird, John Stockton is my favorite NBA player of all time. 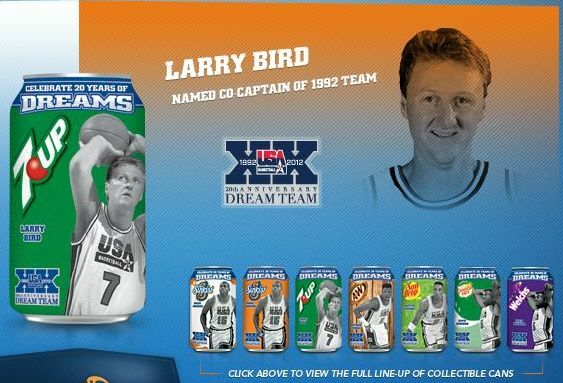 I had planned on just getting the Stockton, Bird and Magic cans, but now, like I said, I’ll have to settle for only the Bird and Magic cans. Which is fine by me, but I would have really liked to have a Stockton can. 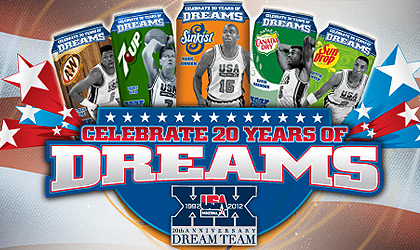 So, the actual anniversary of the selection of the initial 10 Dream Team players is September 21. I’ll be back then with a small retrospective on the team. I had planned on doing this retrospective anyway, but it’s nice to see 7-Up, ESPN and the NBA have also remembered the anniversary of this most historic basketball team. Oh, and NBATV has also been running an hour and a half documentary called The Dream Team. It covers the selection, practices and tournament play of the team with footage and interviews. It’s been running several times a day every few days. Check it out if you get the chance. Here’s the trailer.